Gloss white aluminium panel ideal for screen/digitally printed graphics or vinyl application. Stylish oval steel tube frame available in black or white. 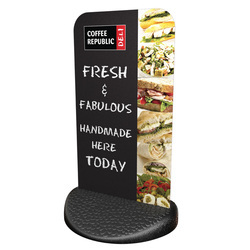 Solid black recycled PVC base offers stability to the sign and is easily assembled for quick high impact street-side promotions! Material: Recycled black PVC base. 50 x 25mm stylish flat sided oval steel tube frame. Powder coated gloss white aluminium panel – ideal for digital/screen printed graphics or vinyl application. Rounded corners and smooth edges for high pedestrian safety. Rugged recycled PVC base provides excellent stability. 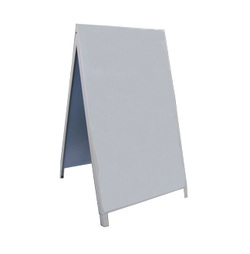 Gloss white metal A board ideal for screen/digitally printed graphics or vinyl application. 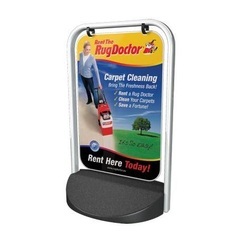 Pavement A board signs for your business to notify your customer base who may otherwise just walk past your company.